Super tasty and super simple. Meatballs in garlic-flavoured tomato sauce with garlic bread on the side. Divide the chopped/minced garlic in half. Set one half aside for the garlic bread. Divide the remaining portion in half again: one portion for the meatballs and one portion for the tomato sauce. Garlic bread: Garlic bread: Put the olive oil, garlic (quantity for the garlic bread), salt and pepper in a small bowl and mix. Slice the baguette – but don’t cut all the way through (leave the base intact). Spoon the garlic mixture in between the slices and over the top. Wrap the baguette in tin foil and bake in the oven for about 15 minutes. Then open the tin foil on the top and bake for another 5 to 8 minutes until the top is nice and crispy. When done, keep warm. Meatballs: In a large bowl, toss breadcrumbs with water (see quantity above). Add lean steak mince, egg, garlic (portion for the meatballs), pepper, and HALF the oregano. Mix until combined. Gently form mixture into small meatballs. Heat about a teaspoon of olive oil (enough to coat the pan) in a large frying pan over medium-high heat. Add meatballs and cook, turning occasionally, until browned, about 7 minutes. Tomato Sauce: Add these ingredients to the saucepan with the meatballs: tinned tomatoes, garlic (portion for the tomato sauce), rest of the oregano, and sugar. Season with salt and pepper. Bring sauce to a boil then turn the heat down to medium-low and simmer until meatballs are cooked through, about 15 minutes. 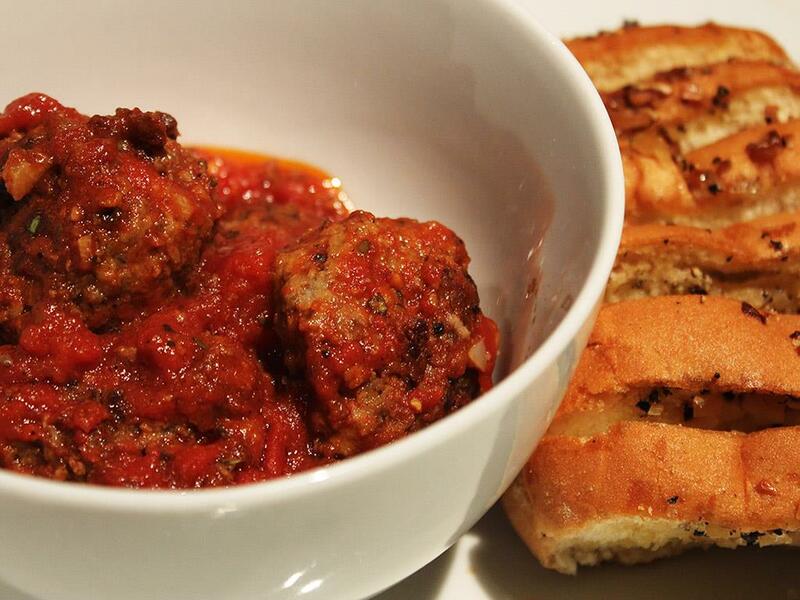 To serve: Place the meatballs and sauce in the bowl and add a serving of crusty, garlic bread on the side.